This two bedroom apartment of 147 sqm, is located in one of the trendiest parts in Prague, maintaining some of the best eateries, traditional Czech pubs, luxury boutiques, world famous shopping mall and amazing outdoor cafes, in the city. If you want a fun night out, you are only a few steps from great music clubs, theatres, shows, entertainment venues and lively vivacious bars. Living at this address you will be only minutes away from the Old Town Square which has achieved the status of an iconic world landmark and has become a symbol of Prague, you will be also within walking distance of the Old Jewish Quarter, the Republic Square, the Na Prikope street and the famous Wenceslas Square. For your convenience you will find everything you need close by, like bakeries, pastries, markets, groceries, wine shops, delicatessen and all you can think of. This apartment is meticulously designed and superbly furnished, to present a comfort of world class modern facilities. It offers a beautiful mix of luxury sprinkled with modern day multi-media facilities including high-speed Internet making it an ultimate choice for an enjoyable stay in Prague. The nearest underground stations are 'Republic Square' and 'Mustek', which are both within easy walking distance and offer an easy access to all parts of Prague. The Apartment Attic Klimentska is located on the fourth floor in a building without elevator. The beauty and the superb location of this apartment, will make you forget the stairs, you can expect the absolute finest from this luxury 5 stars apartment. Property description: 2 bedrooms, anteroom, large living room, dinning area, kitchen, bathroom, separate guest toilet, office corner, dressing room, utility room and terrace. Beds disposition: 2 king size beds and 2 sofa beds. Layout: The apartment offers high quality amenities, it consists of a large living room with an open kitchen, two bedrooms, a dressing rooms, an anteroom with large bay windows facing the terrace, a bathroom and a separate toilet. The living room has a dinning corner and a living area. 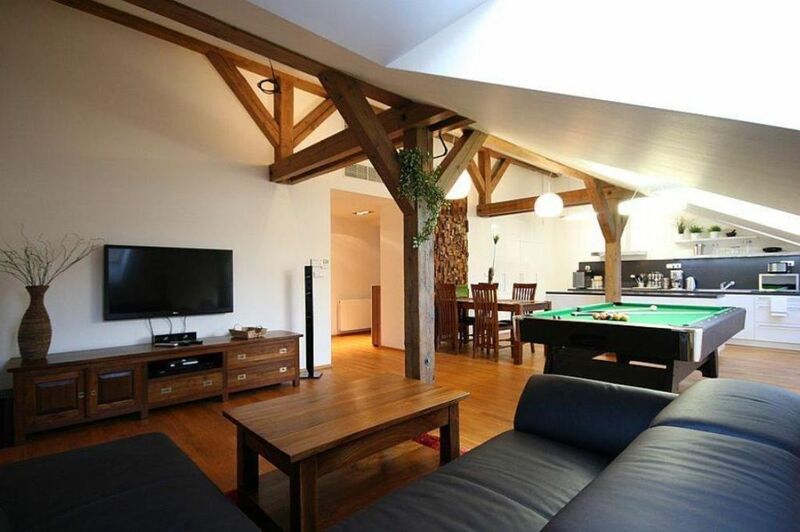 For billiard fans, a superb billiard, allows them to practice their passion in Prague. The kitchen is very modern and fully equipped. The bathroom is large and luxurious. The terrace is superb, where the tasting of your favorite drink in the late afternoon will be a real pleasure! Highlights: Air conditioning, free WIFI , large SAT TV, home cinema sound bar, Bluetooth speaker for connecting iPods, MP3 players, wine cooler, Italian espresso machine, hair dryer, washing machine, dryer and ironing facilities. Medical and anti allergy mattresses, double sided oval make-up mirror, hair dryers, digital bathroom scale, safe and SAT TV in each bedroom. Particularities: Billiard for your enjoyment. Parking available in the vicinity. The cost is about 25 EUR per day. Dinning corner (massive teak): dinning table & 4 chairs. We (family group of six people) were extremely happy with the place. Good introduction, very clean and friendly apartment with everything you need - AC, Sat TV, bluetooth, safe, coffee machine, wine cooler and all kitchen tools you can think of, even including complementary slippers! Great illuminated balcony perfect for smokers ;-). Store and cafe right next door & only a 5-10 minute walk to the city center. Get the LIME app before you arrive so you can rent an e-scooter virtually everywhere for little money. We give it 10 out of 10! We really enjoyed our stay in Prague. Everything went perfectly with airport pickup and apartment check in. Apartment was very clean and exactly as described. It was nice having the coffee machine and spices! We found it easy to get around the city by foot or tram. Restaurant on corner is great for first meal. The location is great! Very clean and comfortable beds. I do think they should warn guests of how many stairs you need to climb to the entrance. There is no elevator and my luggage was heavy. We counted 112 steps all together. The mention concerning the stairs is "very" clearly "specified in the description. Enjoyed our stay, and we were very appreciative of the air conditioning (was absolutely needed for the heat wave during our stay). Apartment is clean, spacious, and well appointed, and has a cozy outdoor patio space as well. (Only warning is that there is no lift, and there are quite a few flights of stairs to climb; with or without luggage, that may be a deterrence for some?) Would definitely recommend this apartment to others. Beautiful place in a wonderful city! This place was beautiful and in a wonderful location walking distance to everything. The home was very well kept and in great order. We had arranged transportation to and from airport directly with them and it was perfect. I used this apartment as home base for 8 days in Prague and surrounding areas. My arrival was simple, and the ownership was on-site when I arrived to tour the apartment and hand over the keys. The location was good, easy enough to walk anywhere in the city. About 5 min walk to the old town square, 10 min walk to Charles bridge, and we even walked to the Castle from the apartment on a sunny day. The layout of this apartment was really great. Very many skylights throughout the house providing natural light during the whole day. Kitchen had everything we would have needed to cook (although we didn't because we were so close to great restaurants). And honestly the pool table was a fun addition to the apartment, but even without the apartment was incredible. Very spacious for a European location, comfy beds, a terrace that fits many people with a view of the surrounding rooftops and some monuments. The owner even provided a cleaning service mid-week which washed linens, counters, etc. 10/10 would stay here again.